The City Commission has awarded the contract for construction of Phase V of the Downtown Decatur Streetscape Improvements to the low bidder, GS Construction of Lawrenceville. Construction is expected to start in February. South side only between North McDonough Street and Church Street. 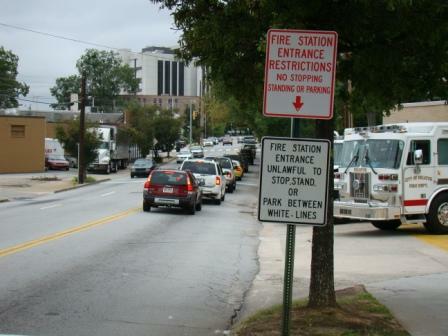 Both sides between Church Street and Decatur Fire Station No. 1. Both sides between East Howard Avenue and East Trinity Place. The work includes new sidewalks, street trees, lighting and street furniture. When the project is near completion, both streets will be milled and resurfaced. Depending on the weather, the project will take 9 – 12 months. While there will be some inconvenience throughout construction, access to businesses is to be maintained throughout the project, except for short periods when a sidewalk or driveway is being removed or replaced. The city will have an on-site project manager to answer questions, help with construction issues and provide information about the project. We appreciate everyone’s patience in finally getting this project started and look forward to a productive 2015. Special Needs Informational Meeting with Fire Dept. Two opportunities to stop by: 10 a.m. or 6:30 p.m.
Fire Station #1, 230 E. Trinity Pl. The City of Decatur Fire Department would like to meet with any families with children with special needs or medical issues. We want to continue responding in the best way possible to care for all families, including those with special needs. The meeting will discuss medical care, large scale events, and fire scenarios with families. In addition, we want to inform families about the benefits of using Smart 911 and exchange ideas on how to better dispatchers’ responses to emergency calls from families with special needs. We need your participation and input to do the best job possible. Please join us on March 12 at 10 a.m. or at 6:30 p.m. at the City of Decatur Fire Station #1. The address for Fire Station #1 is 230 E. Trinity Pl., Decatur, GA 30030. If you have any questions regarding this meeting, please contact Sergeant Violante at Ninetta.Violante@decaturga.com or via phone, at 404-457-3289. Here’s a little something to get you in the holiday spirit: a video of Decatur kids singing “Jingle Bells” during their visit to the Decatur Police this week. Take a close look at this photo and figure out what is wrong. Correct- the cars are stopped in front of Fire Station #1 even though there is a sign reminding drivers to keep the street clear. In fact, a second sign was recently added to remind drivers to look at the first sign. The lines in front of the station were also widened. Still, cars blocked the entrance, and more importantly, the exit, to the fire station. I know I don’t have to explain why this is not a good practice and why I want to remind everyone to keep Fire Station exits clear in Decatur and everywhere you drive. This is how we want to see the same scene! And while on the subject of signs…….I was on my way home on Monday night stopped at the crosswalk on East Trinity and saw one of our City Commissioners walking to the Commission meeting. The Commissioner made it half way across and luckily “peeked” around the cars to make sure no one was coming. Luckily our Commissioner stopped as the car coming down the road sped right through the marked crosswalk. Today’s other sign reminder: always assume someone is crossing at marked crosswalks and slow down when you see this sign……. Have a great weekend here in Decatur, and stay safe!